Neil deGrasse Tyson memes and outrage over Pluto’s demotion recently put astronomy in the spotlight — while growing concern over Earth’s deterioration has suddenly made the hunt for (habitable) planets seem very important indeed. Mars is currently the most popular contender, mostly because of its proximity to Earth. But scientists are also searching beyond our solar system. One of the main goals of the National Aeronautics and Space Administration (NASA) is to find “exoplanets,” or planets orbiting stars other than our Sun. In the past few years, new observational techniques have helped scientists discover a staggering number. In their suitably –if not creatively– named book Exoplanets, Michael Summers and James Trefil partner up for a swift introduction to newly identified exoplanets in our cosmic neighborhood, ranging from “liquid diamond” worlds to “rogue planets.” Summers and Trefil, both astrophysics professors at George Mason University, present an intriguing, unpretentious narrative aimed at non-scientists. The authors certainly know their stuff. Summers is a professional exoplanet hunter. He has served on numerous NASA space probe missions, and is a co-investigator on NASA’s New Horizons mission to Pluto. An accomplished scientist as well, Trefil has written over fifty books for the general public and has won many awards for his work. Before embarking on their exoplanet tour, the authors explain the three main ways astronomers can identify new planets. Although I was afraid the chapter would be monotonous, the authors keep the reader engaged by providing succinct explanations and describing the NASA missions that use these new techniques. The transit method, for instance, measures the amount of light a given star emits. This amount decreases slightly when it has a planet orbiting around it. The transit method is among the most effective and sensitive ways to find exoplanets. A big part of the chapter is dedicated to NASA’s Kepler mission, which thanks in part to the transit method continues to provide three new exoplanet candidates each day. Scientists have identified nearly 2,335 different exoplanets (out of 4,496 candidates). So far only twenty-one could sustain life — but Kepler only scanned a relatively small patch of sky. I can only imagine what the rest of the universe holds! Once we’re impressed by the novel techniques, Summers and Trefil take us on a journey to a few fancifully named exoplanets. First we stop by Diamond World, a planet orbiting the 55-Cancri star. The planet, astrophysicists believe, is composed mainly of carbon under extreme pressure. Molten carbon spews from the core onto the surface, and crystallizes “into diamonds…creating a light show unlike anything we’ve ever seen on Earth.” Embarking on this journey, I felt like I was on an adventurous school trip through the galaxy. Our second stop is Haven, an imaginary (but potentially quite common) “rogue planet.” Rogue planets do not orbit stars, and are thus deprived of light energy. They may still sustain life by deriving energy from other sources — like heat from their own formation, or radioactive decay. From Haven we head to Water Worlds that boast vast oceans. As an avid science news reader, I was surprised to learn for the first time that water existed in exoplanets, and that this has not met with greater media excitement. Data from the New Horizons spacecraft clearly show that planets like Pluto have liquid water oceans below the surface. Such Water World planets also harbor internal energies independent of their stars, and may sustain life. The final stop on our tour is Kepler 186F, a “Super Earth” two to ten times the mass of our planet. Discovered in 2014, Kepler 186F is the closest Earth-like planet identified thus far. Like Earth, it lies in the habitable zone of its star — at just the right distance to have liquid water — and its dwarf star has enough fuel (trillions of years) to allow life to form. Exoplanets was, overall, entertaining and informative. Summers and Trefil state their biases openly, and, when possible, present the opposing arguments. They write in a straightforward manner but keep the reader interested with comical and memorable commentaries. With both scientific rigor and wit, for instance, they explain why Pluto was demoted and strongly defend Pluto’s past planetary status: “The idea of a [small] group of narrow specialists would assume that they had the right to define [what a planet is] with such a wide meaning smacks of a kind of arrogance.” Their playful commentaries are enough to make the reader agree that Pluto should be classified as a planet, but the scientific explanation sealed the deal for me. Even non-scientists will find the scientific explanations easy to follow, if at times a bit repetitive. I certainly appreciated simple explanations of statistical equations that my math teachers never provided. My imagination was invigorated by the authors’ vivid descriptions, and by the beautiful drawings of faraway worlds. Exoplanets succeeds as a general summary of science’s current understanding of the new planets and does a decent job of inspiring the general reader to explore the field. However, I wish more excitement came through in the tone, or that some of the context had been more thoroughly explained. The paragraph on the Dyson Sphere left me particularly unsatisfied. This (hypothetical) megastructure, built by an advanced civilization, would surround a star to harvest its energy. I am certainly going to explore the subject further, but wish the authors had provided more detail themselves. 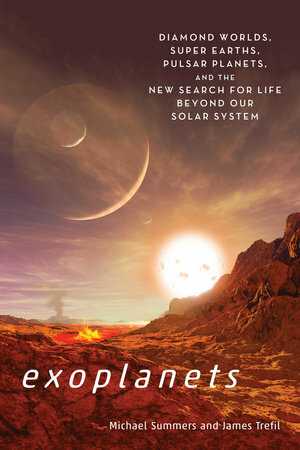 Readers will be captivated by Summers’ and Trefil’s straightforward advice to “give up our old ideas about how planetary systems form and recognize that our own system is only one of the many types that can exist.” If you are interested in following the latest astronomical discoveries, you will find an engaging, informative primer in Exoplanets. Who knows, maybe soon you will be making your own Neil deGrasse Tyson memes. Criseyda Martinez is a sixth year Ph.D. candidate at New York University School of Medicine studying cell biology and biochemistry. In the last few years she has embarked on a journey to read science trade books in addition to her Sci-Fi favorites. She strongly believes that Pluto is a planet. A project of the NYU Arthur L. Carter Journalism Institute.